Fruit rots in strawberry can cause significant losses if not recognized early and controlled. The use of good cultural practices such as keeping fields weed-free and promoting good drainage, long crop rotations, and preventative fungicide applications are critical. 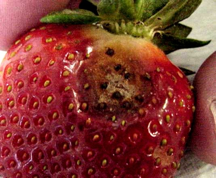 Pathogens such as anthracnose, gray mold (Botrytis), and leather rot (Phytophthora) can become systemic problems in strawberry plantings once established. All three fungal diseases are soil-borne and once in fields can be difficult to manage over the lifetime of the planting. The use of mulch (matted rows) to prevent/reduce soil splashing and keeping fruit from coming into direct contact with the soil surface can be beneficial in organic production systems where conventional fungicides cannot be used. Use of long crop rotations and staying away from areas of the farm with known instances of any of these pathogens is also important. 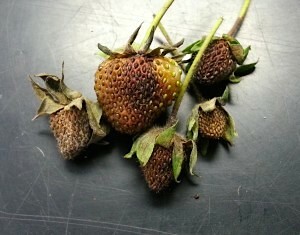 Remember that same species of Colletotrichum that causes fruit rot in pepper and other crops can also infect strawberry. Pristine–18.5 to 23.0 oz 38WG/A or Cabrio–12.0 to 14.0 oz 20EG/A or Merivon–5.5 to 8.0 fl oz. When wet weather persists or during bloom, include Elevate or Switch to improve Botrytis control. Leather rot caused by Phytophthora cactorum can cause losses during warm, wet weather with extended periods of rainfall. Infection can take place during all stages of fruit development as long as favorable conditions are present. Infected fruit turn brown and have blotchy tough appearance. 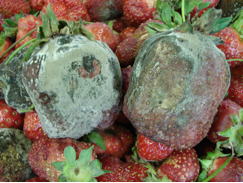 Infections typically occur in fruit that are in direct contact with the soil, but the pathogen can also be splashed onto fruit via rainfall and wind.Research by Dr. Mike Ellis, Using Fungicides to Control Strawberry Fruit Rots in Ohio, has shown that FRAC code 11 fungicides such as Cabrio, Abound, and Pristine are effective against leather rot. Pristine being the fungicide of choice because it also provides control of gray mold and anthracnose. Follow the link above for an excellent review of all three of these diseases and a useful efficacy table. Gray mold is often a serious problem during extended cool, wet periods when fruit are sizing and reaching maturity. Symptoms of gray mold are the diagnostic grey, fuzzy growth that will cover entire fruit.Control of gray mold, like the other diseases, begins with recognizing the conditions for its development, its symptoms, and preventative fungicide applications. Start sprays when plants begin to bloom, because 90% of fruit infections occur through the flower, and repeat every 7-10 days. Increase spray intervals during persistent dry periods, but decrease intervals to 5-7 days during very wet periods. Four weekly sprays starting at 5-10% bloom are usually sufficient for season-long control. Tank-mix and rotate fungicides from different FRAC codes to reduce the chances for fungicide resistance development. If frequent prior use of the above materials indicates a potential risk for resistance development. For more information on the control of anthracnose fruit rot, gray mold, and leather rot please see pages 350-353 of the 2018 Commercial Vegetable Production Recommendations Guide.